Upgrades come in two flavors: software upgrades and appliance upgrades. Software upgrades are released as minor version bumps (eg 2.0 to 2.1) and can be performed directly on the current installation. Appliance upgrades are released as major version bumps (eg 2.0 to 3.0) and require you to fire up a new instance and migrate your existing enterprise data over from the old one. We strongly recommend backing up your existing data immediately prior to any upgrade. 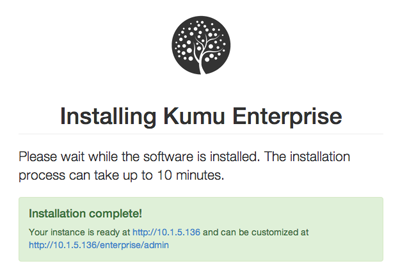 Install the ksb at <hostname>/enterprise/install. Note: You do not need to upload your license again if your license is still valid. Occasionally the underlying appliance will need to be upgraded as well. Although not as simple as the basic upgrade, the process only requires a few steps.